In the last decades, we have been witnessing intense progress of technology and software. This progress is very notable in all aspects of the construction industry and especially within BIM software development. Virtual construction and 4D BIM scheduling software, in a recent market research, are reported as an enormous supporting tool for all main stakeholders involved in construction projects, primarily construction managers, main contractors and respective clients. 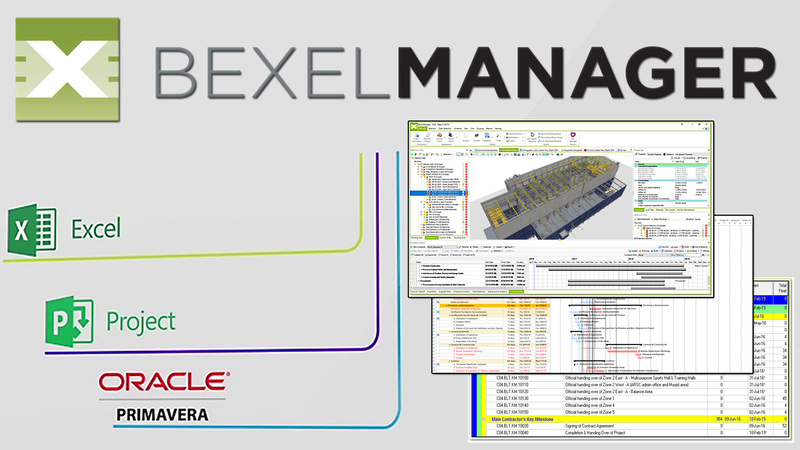 In a very narrow club of expert 4D BIM scheduling software, BEXEL Manager stands out with its unique features and capabilities aimed for managing, scheduling (4D BIM), cost estimating (5D BIM) and even facility management (6D BIM) of construction projects. 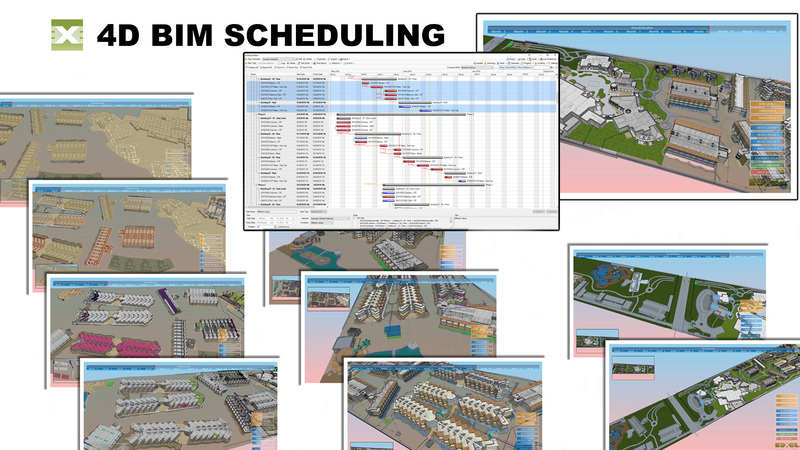 I’ll try to briefly introduce you with its main features regarding construction scheduling which are a true game changer for future BIM construction scheduling processes. Traditional scheduling process starts when planners and project managers typically create construction schedules containing thousands of tasks, down to a level of each single work item. Ordering those tasks, linking and creating their dependencies and relations with assigning and balancing a great number of resources could be extremely challenging and time-consuming, even for the most experienced of project managers. 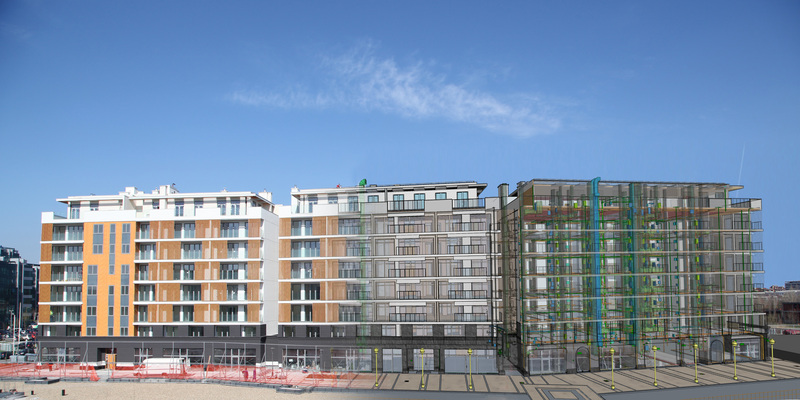 The main purpose of 4D BIM scheduling is to improve planning processes and communication between all stakeholders enabling all participants to visually foresee the entire construction process in a very understandable and natural way. Real-time visual simulations revolutionaries entire planning processes leveling-up traditional Gantt chart planning with a 4D virtual presentation of entire project execution on your screen much before you even break ground. Improved time and cost savings which may vary but can go up to 500% in term of time required for schedule delivery. Additional benefits which are not expressed through time and cost savings but which are also greatly affecting and increasing scheduling and construction process are 4D visualizations. Model-based scheduling and estimating processes help the entire team to identify and optimize all designed details. Efficiency and accuracy of created 4D BIM visualization enable project experts to identify and mitigate risks in the very early stages of the project, much prior their actual construction on the site. It also enables planning teams to run different construction scenarios in order to produce the best possible solutions while simultaneously checking their impact on expenses. All schedule changes and Gantt chart variations made - are immediately updated and visible in the 3D scheduling view. Today – many software solutions are advertised or misused as a „4D BIM software“ however, there is a clear and obvious difference between 4D BIM visualization and 4D BIM scheduling software. 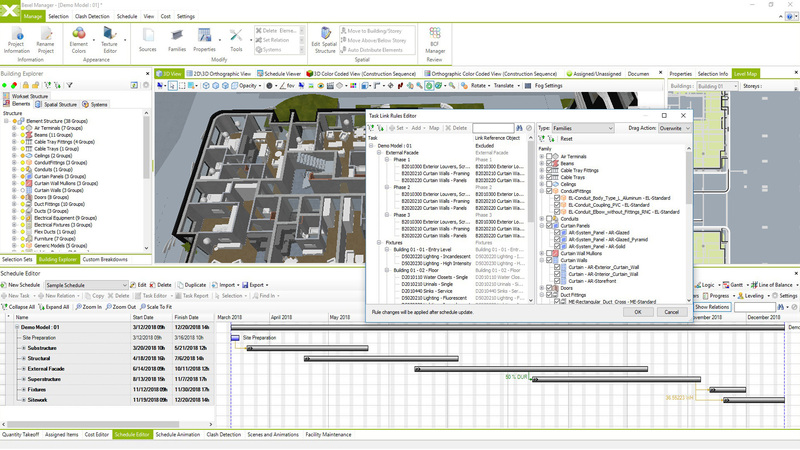 Although „4D BIM software“, generally speaking, enables the production of virtual construction simulation (visualizes construction processes), 4D BIM scheduling software such as BEXEL Manager - allows users to visualize construction process and additionally, it also allows user to virtually plan (create schedule) construction project. 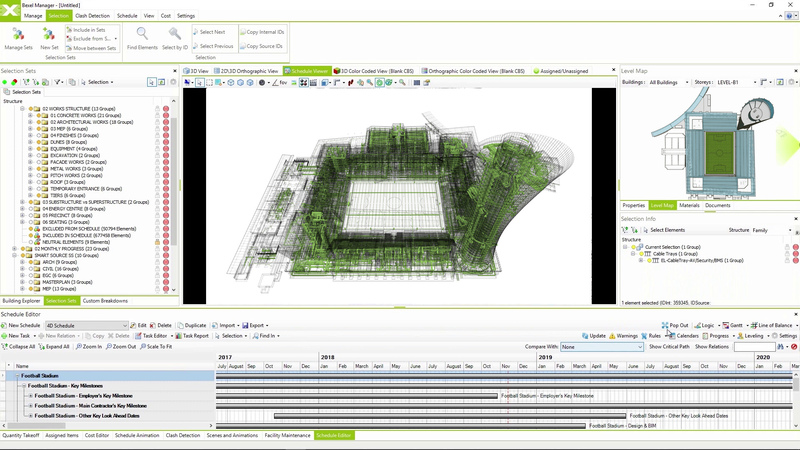 4D BIM Scheduling software lets you create and change planned tasks/activities, you can also change their duration and predecessors/successors as well as optimize and validate the sequence of these activities – all within the software itself – while almost simultaneously, visualization of your changes has been updated in the 3D scheduling view of the software. On the other hand, BEXEL Manager’s scheduling engine implements advanced scheduling algorithms, specially designed to bring the functionality of creating fully automated construction schedules and eases painful, manual 4D sequencing. That’s where the true power of BEXEL Manager lies. Unlike the other 4D BIM solutions on the market, where you need to manually or semi-automatically create schedule activities based on available BIM model elements – this comprehensive 4D-5D-6D BIM solution uses a visionary concept that allows planners and managers to express their engineering expertise easily. Its unique and intelligent scheduling engine enables the creation of construction methodologies and construction activity groups in a way as the planners actually think and anticipate execution processes in their mind. Similarly, they can create activity groups of different task levels based on anticipated construction phases, buildings, activities and items. Next step is just to create logical relations and dependencies of these activity groups and methodologies. In the almost same manner as most of the experts already used to, doing it in traditional scheduling software, here you can select a type of item relations (e.g. Finish to start, Start to start, Finish to finish, etc.) and duration or lag of created relation. Additionally, as a next logical step to BIM construction management process is to assign labor, equipment, material resources and their costs to tasks and reach next BIM dimension – 5D BIM. The solution enables you to implement multiple and custom cost classification systems for different cost versions within the same model which is very doable in the 5D BIM module named Cost Editor. Moreover, the user can manage, view and export cost, labor, material and equipment graphs, and reports. Track planned and actual costs, and once construction breaks ground - track and update schedule progress and analyze planned vs. actual progress, what-if scenarios and mitigation strategies. The cognition that a user is enabled to handle and manage practically all BIM dimensions (3D, 4D, 5D and 6D) within one integrated software platform is very valuable. Furthermore, all created methodologies are being saved in the software so a user can store various templates for automatically schedule creation using previously defined methodologies and their variations. Once created construction methodology uses full-featured CPM (Critical path method) scheduling engine to find an optimal solution in terms of minimum construction cost & time and resource balancing – yielding fully detailed construction schedules in a matter of seconds even for the most complex projects, containing hundreds and thousands of tasks and respective elements. All previously saved methodologies and templates can be re-used for any other similar type of project in order to almost instantly generate construction schedules and produce 4D BIM simulations. The initial, automatically generated 4D BIM schedules can be further fine-tuned by the user, by introducing a specific ordering of phases and activities along with linked BIM model elements in both temporal and spatial sense. Resource quantities can also be defined and modified for any single task, subcontractor company or phase. A user can change and improve visual construction sequences by using custom color schemes for elements, tasks and resources. Additional changes and exceptions can be made by implementing custom calendars for tasks and subcontractors. Management, optimization and sorting of a great number of tasks by any model criteria are extremely easy and intuitive using inbuilt schedule filters. Planning teams can also visually and within Gantt chart - compare different schedule versions and planning methodologies directly in the solution, easily switching between several different cost versions for any of the scheduling options. Finally, all activity task duration can be manually modified, before finalizing 4D BIM schedule and construction video simulation. All created schedules can be exported from BEXEL Manager into traditional and more commonly used scheduling software such as Oracle Primavera™ or Microsoft Project™, Microsoft Excel™ platforms. All schedule activities, durations, links and dependencies originally created within BEXEL Manager shall be retained and saved in the exported files enabling seamless interoperability. Mentioning interoperability, note that the solution also enables import of traditionally derived schedules from previously mentioned scheduling tools. As explained - all tasks, duration, links, and dependencies originally created shall also be retained in BEXEL Manager. Unlike the majority of 4D BIM software on the market - where the linking process of imported schedule tasks with respective model elements is mostly done manually, BEXEL Manager uses an intelligent engine for semi-automatic linking of elements and activities using pre-defined rules, name/ID of the activities and hierarchy level schedule activities. With easy visualizations of each model element selection set and cross-checking with categories, families, properties of each element and enhanced search capabilities based on its properties and other criteria, the linking errors are almost eliminated. Once the schedule is imported – any additional fine-tuning, task modification and checks are possible within BEXEL Manager schedule editor. When all activities are linked – software generates 4D construction simulation video suitable for real-time review by project stakeholders. Created virtual 4D construction simulation can also be exported as a video file. Once all stakeholders, primarily planners and project managers embrace full potential and benefits of Intelligent 4D scheduling processes - entire industry shall profit and evolve, leading us in a very reachable and tangible future of BIM construction where parametric 3D design, real-time construction simulations and flawless information sharing are part of everyday business.